CE approved ( patent No. 86144 ). 1. This unit is designed for medium content bag sealing operation. 2. Conveyor table tilts 0o~30odegree downward, allowing products to concentrate at bag bottom that prevent product flowing out. 3. 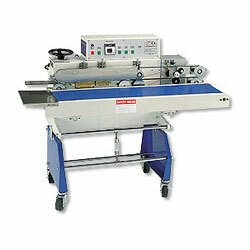 Equipped with printer for printing manufacture date, expiry date,lot number and weight. 4. Single or double lines printing. 5. Fully gear drive assures long service life and superior sealing quality. 7. Height of sealing head from floor 730mm. Ergonomically designed to minimize fatigue. 8. Iedal for sealing dry powder,solid goods,hardware kits,stationery,electronic parts,and medical instruments. Bag length range 4-30cm. (Increased conveyor width is available).